A SINN FÉIN motion calling for members to be allowed vote on the issue of abortion according to their conscience is due to be voted on this weekend. Kicking off on Saturday, the party is holding a special Ard Fheis in Belfast, where two of the key motions relate to the party’s position in relation to the upcoming legislation which will give effect to the recent referendum result on the Eighth Amendment. The first motion calls on the party to recognise the referendum result and to legislate in line with the views of the Ard Comhairle, which will be informed by the “best medical advice when legislating regarding the limited gestational period”. This motion relates to the 12 weeks time limit which is proposed in the draft legislation put forward by Health Minister Simon Harris. The second motion asks that members be allowed “articulate and vote” in accordance with their conscience. 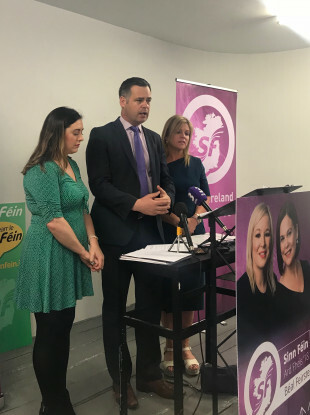 On the conscience vote, Sinn Féin’s Pearse Doherty said the issue has come before the Ard Fheis on four previous occasions and it has been defeated each time. At last year’s Ard Fheis in November, members did vote down the option for elected representatives to be allowed to vote on the issue of abortion according to their conscience or personal opinion. Speaking to reporters today, Doherty said he believes the motion on a vote of conscience will be defeated again. However, he said whether the motion is passed or defeated is an issue for the party membership this weekend. The decision of party members will stand under Sinn Féin rules. He said that while many people have different views on the issue and there are “strong personal held views” within Sinn Féin, there cannot be dissent on the issue, in his view. “When it comes down to legislating and voting… members need to fulfill the will of the membership of the party,” he said. If the motion is defeated again, it will increase pressure on TDs such as Peadar Tóibín and Carol Nolan who both campaigned for a No vote ahead of the referendum. Nolan’s position against holding a referendum resulted in her party membership being suspended for three months. Tóibín told TheJournal.ie prior to the referendum result that he accepted that he might lose his job over his stance on abortion. Doherty said Sinn Féin rules are very clear when they state that any member that votes against party policy will face “disciplinary procedures”. When pressed on what exactly the disciplinary measures are, he said that in the past members have been suspended from the party for a certain time period. Doherty’s comments today hint that party members might escape expulsion from the party over their position on the abortion legislation, but could face a substantial suspension period. “The outcome is very clear. There are no surprises here, anyone that breaches the party rules as has happened in the past, where Carol Nolan has voted against the legislation where Peadar has voted in the past, there has been a suspension in their membership,” he said. The time period in which the TDs could be suspended will “be a matter for the party president and chairperson”, said Doherty. “Obviously every case would be different depending on the circumstances,” he added. Email “Sinn Féin motion calls for conscience vote to be allowed on abortion”. Feedback on “Sinn Féin motion calls for conscience vote to be allowed on abortion”.